Remelted some scrap fine silver I had, adding in shreds of two half-coins I accidentally made from the first batch of zeroes to make 6g, twice the mass of the previous strikes. Used a charcoal briquet (non-kerosene-embedded) that I leveled and dug a pit into for the melting. It seemed to work ok- a little snappier than the compressed hard charcoal brick I got from the jewelers’ supplier because it had some shreds of wood in it, but once it got cooking it worked pretty well. 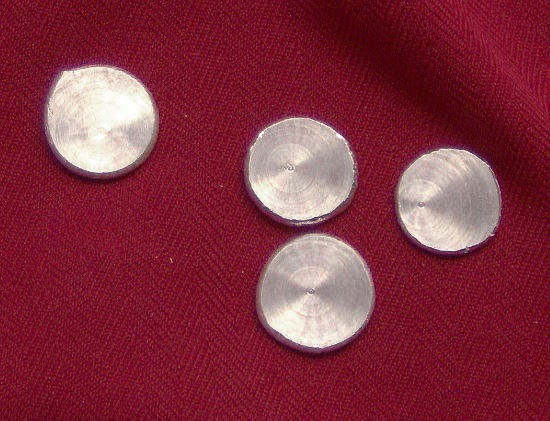 Annealed and struck three times to yield a coin 16.5 x 2mm (approx. 5/8 x 1/16 inches) in dimension, filling the smaller of the two mint collars. 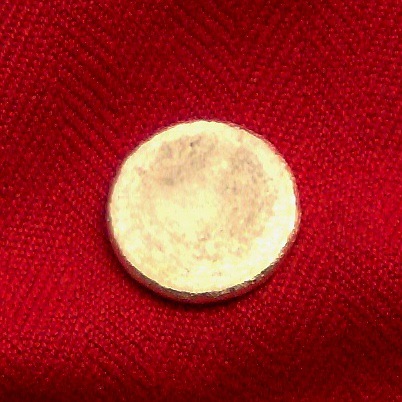 Also struck the electrum zero with my maker’s mark and then burnished around the mark. This marking (since it’sthe one I’ll keep for myself) felt right. Still unsure about marking any of the silver zeroes. In the past couple of years of trying to determine just what kind of artist I am amidst the wide and swirling world of magical implements, talismans, gallery, museum, and market art, conventions keep popping up that I sooner or later have to decide how I feel about, and how I will negotiate. A few notes on the latest here. Convention: sculptural work bears the artist’s signature (makers mark) and serial number if part of a limited edition. Convention: precious metals bear a hallmark of their constituent metal’s provenance- .999 for fine silver, .925 or the word STERLING for sterling silver, and a number followed by a “k” for karat golds. 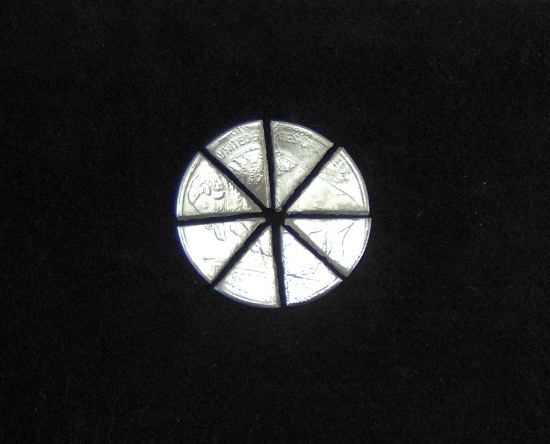 The coins, particularly these first “zeroes” are small. They have no hidden inside or back where a mark would be sufficiently hidden to not interfere with the expressive surfaces of the pieces. My early impulse was that the “stars” on the faces and their varying radiating arcs need to remain clean and clear of any symbolic marks, especially ones that are alphabetic. Would it be enough to have one side unmarked but for the points and arcs, and place my maker’s mark on the other? I hesitate, but why? Isn’t my mark one of the contributing factors in legitimizing the value of the pieces as art, as a king’s mark legitimized the coin of the realm? Would it simply be me taking public responsibility for creating them? Would it still be a “zero”? Would marking it with my personal mark impede its circulation, limit its potential to embody fulfillment of desire (give it too much “character”)? The third side, the edge is a possible surface. But again, I hesitate to disrupt the irregularities, the small peaks and valleys in the landscape of that surface with an alphanumeric mark. I like this (for this series) even less than marking a face. Having marking stamps much smaller than the ones I currently have (.5 or .75mm, say, instead of 3mm and 1.5mm) would help, but I don’t have those now and this series needs to wrap up with the equipment I already possess. To make a truly slippery and flexible (in terms of value-summoning and desire-holding) currency, there must be no trace of the individual beyond the determining of the composition and formation, the result. In image-rich coinage, we enter the land of the Symbolic with a capital S. We see the hand of the king, the mark of the people, or the spirit of the land in our palm. It should seem as though it was exuded whole from the source of its value; from god, or the angels, for from the Empress’ own lap. We go there, we believe it and others do too. It moves, flies, circulates, setting bodies and materials into motion. That’s the magic – the belief (projections) and the motion inspired by encounter with the object itself. It’s not made for the maker. It’s made for the possessor and the limits of their own imaginations. Should I try for that degree of malleability on my first outing, or must I assert my ego identity as creator through the mark until I know how to make it invisible yet present. Probably. The above sounds like a masterwork. I don’t know. Besides, the zeroes may not be made to fly quite in that way. As to the one piece I will keep, when I look into the faces I see a heaven with stars as well as the effect of my ordered artifice and physical force. When I look at the edge I see undulating earth, the truth of the material expressing itself. When I look at the whole I see both a vast horizon and the real and present child of my desire. I have already bought the world with it, so what would I wish to exchange it for? I realize that my feelings about it are unique and personal. But visually, might others read similar things in these tiny discs? I won’t know until I “put them out there”. Back to the question of the mark: would this drag them back to me too much? 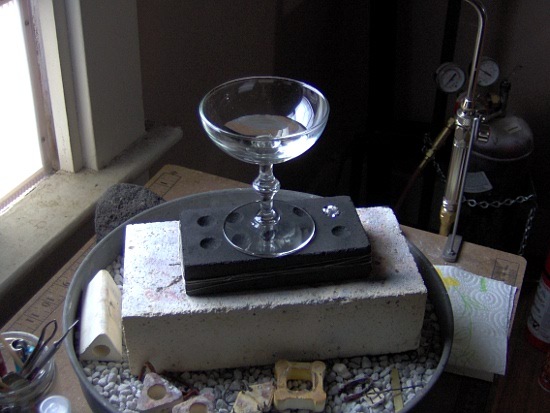 Another aspect of many pieces I make is the talismanic quality- they are made to be objects of contemplation or functional concept-holders and/or transmitters for someone who is not me, who will be actively using it ceremonially or meditationally. Many times the entire surface is active in fulfilling its function. In these cases it almost always feels best to hide or leave off a signature, or find the symbolically appropriate place for the maker’s mark to be. For the most part, though, the whole visible and touchable surface should be free of anything that would impede the operator’s use of the object, both psychic (by which I mean “involving the psyche”) and physical. A prominent maker’s mark would pull the operator out of his or her “moment”, even if subtly/subconsciously just by seeing it. The ego inhabiting should be the operator’s, with no interference from another. This could be a whole other topic- visual form and function in magical weaponry. To take Shoji Hamada’s traditional view, nothing speaks more fully the craftsperson’s signature than the whole of the being of the created work. I tend to find that view very appealing. But there are certainly ways in 21st century America that that could be a hindrance. If one pursues conventional modes of selling one’s work. Also, the metals number, .999 for all but the electrum piece- It might be enough to accompany each zero with a certificate attesting to the purity and type of metal. The series numbers could go on one of those too. I could do something clever and mildly propagandistic with the nines so as to make them appear as sixes in artful swirling arrangement. Accompanying my personal mark, that would be quite a boast. It would certainly help me sell them to a particular group of persons. No, that’s not the point of the zeroes, so no. 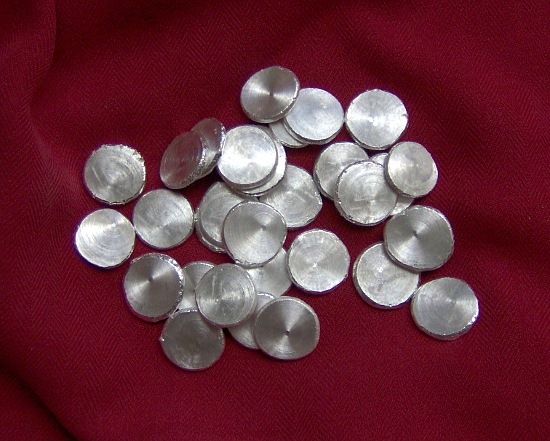 However, if they are unmarked, a person wishing to sell them to a metals dealer for their value as pure silver would have some trouble without the mark. They might have some trouble anyway, as the form is unconventional. Photo documentation on the certificate might help, along with the other information certifying the piece’s origin and my guarantee of the metal’s purity. I would hope that the owner wouldn’t want to sell the art as scrap silver for the relatively small $ value, but it should be an option, and one I will facilitate if I can. Struck inside crater of Mt. Tabor just after sunrise 12/22/2011. 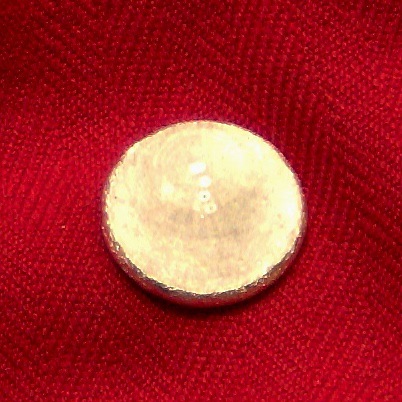 1.6g 24k gold combined with 1.6g .999 pure fine silver producing a 3.2g nugget of 50-50 alloy electrum (by weight). 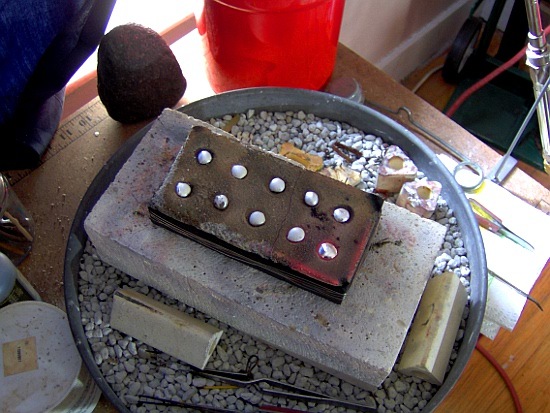 I snipped up the 24k gold wire into fine (1mm or so) shreds, and in a bit of an excited hurry to combine it with the fine silver, I dug out a new pit in the charcoal block with the ball bur and put all the shreds of both metals in it. 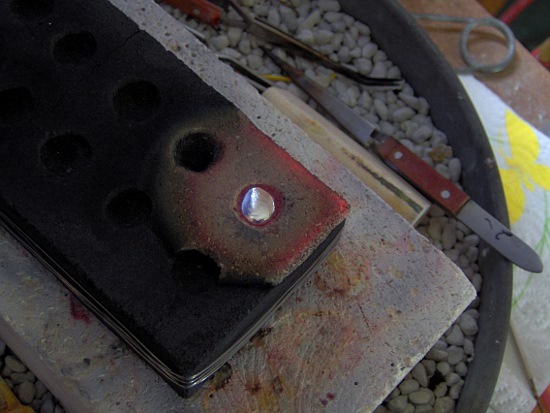 I also used a larger torch head since gold has a higher melting point than the silver. Spent about an hour melting and turning, melting and turning the little blob of metal in an effort to get all the gold shreds to melt into the already soft/flowing silver. Looking back (and after doing a little more careful rereading of sources on the subject) I realize what I should have done is melt the gold to flow first, then add the silver chunks to the already-melted gold for better blending. It should also have been stirred. 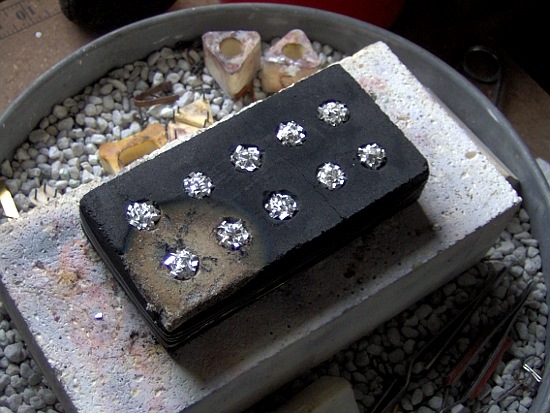 Quenched and remelted a total of four times, coating all with flux for the final melt. Initially, the gold bits glowed red long before the silver even began to glow. Each held its form in individual shreds for quite a while, as the charcoal block grew hotter under constant flame. 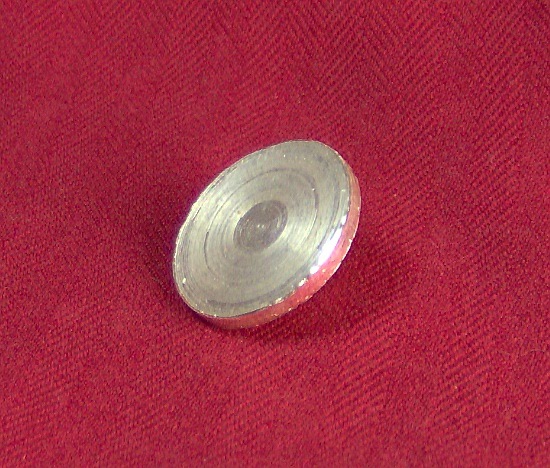 The silver flowed, and the gold retained its integrity as red grains among a mercury-like flashing silver liquid drop. 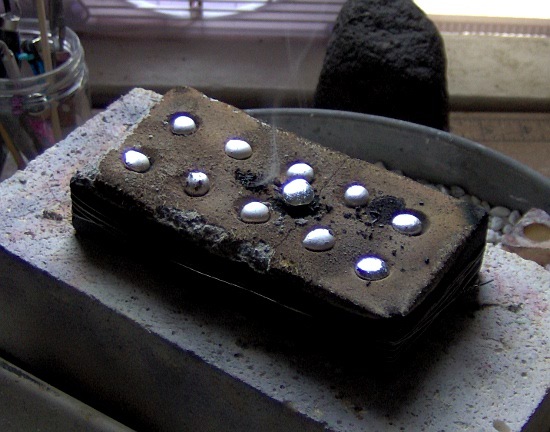 I intensified the heat and continued turning the bead until I watched all of the gold shreds lose shape and melt into the silver. On the final quench, it was apparent that all had melted together, but was not mixed evenly. There is a fine pale yellow sheen of varying intensity over the whole surface area of bright silver . It’s likely that most of the gold is concentrated in the center core, surrounded for the most part by a layer of fine silver. It is beautiful, but it requires stirring. 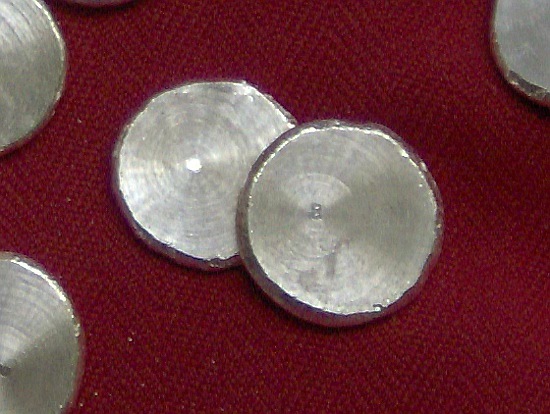 The metals are joined but not fully dissolved into one another. Being in a hurry to do something exciting frequently makes more work. This time, I do not mind the more work part because looking at the little mirror-surfaced droplet rolling around on the charcoal was wonderful, watching one metal hold tension, then sigh and release into the other is pretty exciting. Fortunately I didn’t do anything that would even remotely ruin the $100+ of materials this time. When I get the carbon stirring rod and crucible, I’ll remelt it and stir the metals together for an even more thorough blend. But still…. the best rule is to HASTEN SLOWLY! ( and read, re-read, re-read, and re-read again prior to jumping in). 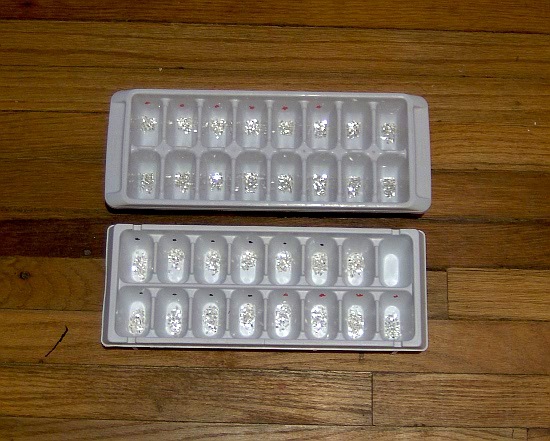 Three 1ozt fine silver pieces yielded 31 three-gram portions, with 2.1g left over. Today I am grateful for the PEPE 6″ guillotine shear (one of my first studio purchases). 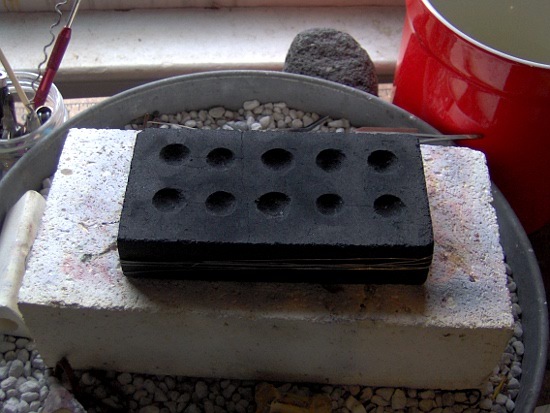 Still, it took me a couple of hours to chop the measured 3g chunks into fine “metal confetti” in preparation for remelting into individual solid pieces. You are currently browsing the Jackbird Arts blog archives for December, 2011.